One of the pleasures in reading Peter Carey’s Amnesia comes from his language, so I do want to share examples of that, but first I want to say something about the style and structure because I didn’t get to discuss it in my review. One of the criticisms I’ve heard about the book is that it’s disjointed. Some really like the beginning but then find they lose interest. I didn’t find this, but it’s interesting because there is something about the structure of the book that might create this response. 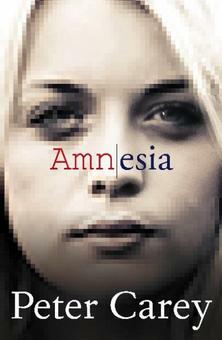 Amnesia is divided into two very distinct parts. Part 1 is told first person in Felix’s voice. It’s here that the story is set up. We learn about the Angel Worm, we learn a little about the four main characters, and Felix starts to realise the import of the challenge he’s been set. Part 2, the longest part, is told third person as Felix, first in a primitive shack on the Hawkesbury River and then in a motel in Katoomba, listens to tapes in which Celine and Gaby tell their stories while he tries to fashion it all into a book. Carey switches between telling us what Felix is thinking, experiencing or up to, and letting us hear Celine and Gaby on their lives and how Gaby turned into the “hacktivist” she is. There is no set pattern to the switching between these three lives, so the reader does need to pay attention, but overall I found the transitions clear. As always, the omniscient narrator had a very wobbly grasp of what was happening. As much as I enjoyed the book, I must say that without a re-read, I will admit to also having a wobbly grasp of some of the novel’s finer points, but I believe I got the gist. The street had a snotty name but the trees were weedy, starved of love, survivors with hessian bandages. Gaby was shocked by the cracks in the concrete, the lonely quiet, the little houses shrunk inside their borders, alone, disconnected. They saw a malevolent cluster of boys like rats with mullets, operating on a Datsun 240Z, roaring, revving, sending oily smoke across the intersection. One lay on the mudguard, deep into the engine, his plumber’s crack shining at the sky. This is a little – and comparatively straight – example, but I like it. Most authors argue that they shift narrative voice because of limitations of either previous tries or previous perspectives. Yes, good point Guy. I’m keen to know what different perspectives Carey wanted by the switch from 1st to 3rd. I suspect, for a start, the satire might have been difficult to sustain in 1st person throughout. Thanks for this follow-up post. It made me remember the reason I do love Carey’s books so much, and what I did enjoy about this one (despite reservations elsewhere expressed). For me, Carey creates such strong Australian scenes and characters, in many cases treading a careful line between caricature and reverence. Sorry for the late reply 36views. I’ve been on the road and not properly attending to my blog. I like your description of Carey treading a careful line between caricature and reverence. Can be tricky to do, particularly in satire like this. You want the satire to show but you don’t want to alienate your readers. “malevolent cluster of boys like rats with mullets” oh I love it! Also love the wobbly quote. Haha, glad you liked them Stefanie. I must remember the wobbly one. I didn’t even know PC had a new novel out and for some reason I’d stopped reading his stuff years ago; I think there was a book I didn’t like much–something about a boy being kidnapped maybe? But the passage you quote above makes me wonder what the hell I’ve been doing not staying up to date. It’s hard to keep up with all the authors and their books. Was that Parrot and Olivier in America? Anyhow, the thing about Carey is each book is usually very different in style, so not liking one may have little bearing on whether you like another. No, I haven’t read Parrot and Olivier yet, though I have a copy…I’m going to give him another try.